As a SSB recruitment by the Staff Selection Board, a new career related advertisement has been released with the name. Dedicated and result oriented competitive draftsmen, 28 candidates for Hindi Typist, stenographer, computer operator, can fill online applications by the last date of 26th, 30th and 3rd November 2018. Academic Description: Candidates have 12th / Diploma (Draftsman / Computer / Animal Husbandry) / Engineering Degree (Civil / Electrical) / Bachelor Degree (Computer / Statistics / Mathematics / Economics from well recognized Board / University / Institution as per post ) Should be. Candidate should be between 18 to 30 years (10 posts). Candidate should not exceed 30 years of age (post 1-9, 11). Pay Scale: Applicants who will be successfully selected against this recruitment will receive effective and satisfactory salary of rupees. 35,400 - 1,12,400 / - (post 1,2), Rs. 25,500 - 81,100 / - (post 3,6, 9, 10), Rs. 29, 200 9 - 92, 300 / - (4,5 posts), Rs. 19, 9 00 - 63,200 / - (7,8,11 posts) from the recruitment organization. Draftsman, Hindi Typist, Stenographers, applicants for Computer Operator will be selected based on written examination and merit list. First, go to the web portal of SSB which is http://www.daman.nic.in. The last date for submission of online application form is: 26-10-2018, 30-10-2018 and 03-11-2018. 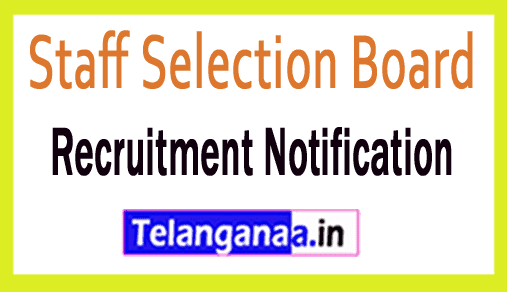 Staff Selection Board has published a vacancy notice for SSB Recruitment. Enthusiastic and talented participants must submit the form via the online mode for the 191 publications of the Graduate Teacher, Trained Graduate Teacher, before the end date, which is 2 September 2018. Academic Details: Applicants must be M.A. / M.Sc. / M.Com / degree / B.Ed / B.P.Ed / BCA / BE of a university / institute well recognized after publication. Applicants who request one of the above publications and belong to the All category must pay a registration fee of Rs. 100 / -. Applicants wishing to apply for the above publication should not exceed 35 years (Post 1), 21 to 35 years (Post 2). How much will I receive as a pay band ? : Applicants selected for the Postgraduate Teacher will receive the salary band of Rs. 47,000 - 1,51,100 / - (Post 1), Rs. 47,600 - 1,42,400 / - (article 2). Applicants are recruited against this recruitment due to their performance in the computerized test conducted by the recruitment committee selection committee. Applicants wishing to apply for the SSB position should visit the official website of the organization http://www.dnh.nic.in. The start date for the online application is: 03-08-2018. Deadline for applications online: 02-09-2018. The Staff Selection Board has announced a recent announcement about SSB Recruitment. Eligible and talented jobseekers can apply by submitting an application form for the 62 positions of Forest Guard, Telephone Officer, Junior Engineer before the deadline on July 28, 2018. Qualification details: Applicants must have completed the 10th / ITI (Electrician / Wireman) / 12th / Diploma / Engineering degree (Electrical Engineering) / B.Com or equivalent with good grades from a recognized university / institution. Applications from candidates may not exceed 30 years (Post 1), 25 years (Post 2, 3). Salary Scale: Applicants who are appointed against this recruitment receive a consolidated salary of Rs. 35,400 - 1.12,400 / - (Publication 1), Rs. 19,900 - 63,200 / - (Poste 2,3), Rs. 21,700 - 69,100 / - (Post 4) of the recruitment organization. The selection of jobseekers for the earlier releases is based on their appearance in the computerized test and typing test, the physical exam conducted by the staff selection Board at the appointed date. Visitors must visit the official website to request SSB and it is http://www.daman.nic.in. The online registration of the application form starts on: 29.06.2018. The last date of the online application is: 28.07.2018. Click Here SSB recruitment notification . Qualification: These applicants have a minimum qualification, as applicants wishing to apply for SSB jobs will be admitted to the 10th / 12th. Diploma (Computer Course / Civil Engineering) / ITI (Surveying) / Graduation Title / Diploma of PG (Cooperation / Cooperativa Administración) of a board of directors or a recognized institution. The age of the candidate must be between 18 and 27 years (after 3.7), from 18 to 30 years (from 3 to 5 years). The maximum age limit for candidates for postulation is 30 years (Post 1,2,6). Salary Structure: Candidates who are successfully selected against this recruitment will reach the salary of Rs. 35,400 - 1.12.400 / - (Publication 1), Rs. 29,200 - 92,300 / - (Post 2), Rs. 25,500 - 81,100 / - (Contribution 3), Rs. 21,700 - 69,100 / - (Post 4,5,7 ), Rs. 19,900 - 63,200 / - (Post 6) of the Recruitment Organization. The organization may conduct a written test / computer-based test / walk test to select the most suitable candidates. The latest date for the online submission of your application is: 27.06.2018, 30.06.2018 and 03.07.2018.